Your Wealth ~ Abundance~ Joy NOW! : Receive Money and Prosperity $ Now! 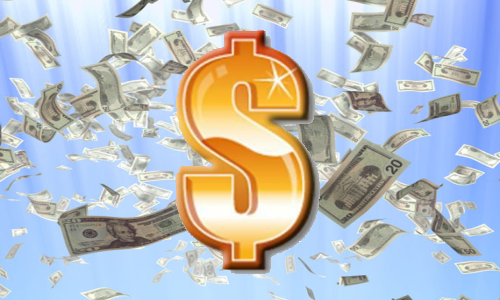 Receive Money and Prosperity $ Now! Could your Money flow use a boost? Is your Abundance flow not flowing? Do Something Different ... Receive a Money Reiki Healing! Money Reiki Healing balances and strengthens your energetic system in the area of money. Money Reiki Healing involves the channeling of energy to balance and bring your energy field into alignment with that of money energy. This energy heals money issues, not just on a personal scale, but a planetary one as well. We are all One, what affects the microcosm affects the macrocosm. You will move from stuckness and struggle to flow and ease in the area of allowing money in your life! Reiki: Is a Japanese word representing Universal Life Energy. Reiki practice is the channeling of Universal Life Force Energy through a Reiki practitioner which brings the recipient's energy field back into balance and alignment . This in turn restores the physical body and physical manifestations. Reiki works because everything, without exception, is Energy. Money vibrates and you can be attuned and aligned with it's vibration! Enter Your Email Below To Receive Your Money Reiki Healing Gifts! I have been listening to your Free Recorded Money Reiki healing and find the channeled energy amazing!!!! There is a very palpable transmission of healing energy from the mp3 and I feel greatly energized and grounded after listening to it. The quality of energy is highly transcendental and pure. Having worked with various healing modalities, I know that this is truly phenomenal! Since the healing, things on the money front things are growing tremendously! I've gotten four old clients contacting me out of the blue - and already one semi-regular client is going to be a monthly client for my business, which is money I can rely on for months to come! You are so awesome and an incredible channel too! I am thrilled to have crossed paths with you. I loved the energy transmission and will do it daily and will work with intention with your questionnaire. Wow, very strong and loving. I love everything you offer. THANK YOU THANK YOU THANK YOU!!! I have been able to listen once and I have just found out I am getting a tax refund !! Whoo Hoo it was fabulous news. I did feel the tingling sensation around my face and head! I have just been to an interview for a good job now, I am just waiting to hear from them. Just under 2 weeks using the Money Reiki Healing: Wow!!! Life has been wonderful and even now I am not sure which position to take. I have to make a decision tomorrow in connection with the offers that I have received. You will be hearing a lot from me. God bless you, you are an angel on earth. There has definitely been a shift in my financial situation. Although at the moment I have no more money I do feel and seem to be financially more comfortable. Its' amazing. Since the healing I have been putting major focus on creating and developing methods of increasing my income and I feel great about that. I'm definitely much more positive and can almost feel pending success. Thank you. "... Great!!! After the healing I won $150.00 on the mega millions lottery. I look forward to your continued enlightened help." "...things are beginning to change for the positive, I have a potential buyer for my business who is making up his mind over the next two weeks. That was my focus during the healing. The sale will bring me money and freedom to actualy create more of both." "Thank you so much for the free Money Reiki Attunement. It was so powerful and I was buzzing and tingling for ages after. I really felt blessed out! You are such an Angel. Thanks again so much!" The Money Reiki Healing was absolutely wonderful. I felt an incredible sense of comfort and well being. The energy just surrounded me with very gentle tingling. I haven't had any of the typical anxiety that I normally have around money issues. Thanks a million! I just wanted to let you know that your Reiki energy is very powerful. I am very sensitive to any kind of energy and went into a deep meditation as I was lying on the couch and receiving the energy. This morning I had some interesting thoughts that just came up all by themselves about visualization and how I think and feel about money and being truly prosperous. I laid there for a few more minutes, continuing to focus on my breathing and a subtle wave of emotion hit me followed by visions of receiving checks in the mail.. the amount increased quite a bit more than I originally intended. The visions were mainly of me opening up envelopes, seeing the amount of the check and depositing them into the bank. Today I woke up earlier than usual and I feel optimistic. I don't have nearly as many thoughts rushing through my head. Its been over a week since I was on the previous Money Reiki Healing energy. I do sense a shift on how I view money. I keep finding small amounts of money in various places, perhaps these are signs of our true abundance that is available to us. I definitely feel there’s a shift going on and for the better. Thanks again for bringing more joy into my life! "I was actually at work and in a meeting during the healing session. Could not avoid the meeting. Did drink lots of water 5 minutes before and tried to relax. Could feel the warmth, the tingling sensation at times. After the session, I felt very relaxed and light-headed. I checked my lottery ticket and found out that I won $9." ... Great!!! After the healing I won $150.00 on the mega millions lottery. I look forward to your continued enlightened help." "I've had a very interesting shift in my negative mind-set!! Over the past two days I've gone mad and bought two bunches of flowers, a candle and a bracelet for myself!! That is really something for me as I've always struggled to buy nice things for myself especially flowers.I'm truly grateful for the Money Reiki Healing and I'd say I've experienced healing and transformation from it so far." "...things are beginning to change for the positive, I have a potential buyer for my business who is making up his mind over the next two weeks. That was my focus during the call. The sale will bring me money and freedom to actualy create more of both." "... I would say I feel a calmness about my money. I will be doing some transferring and paying some bills today. I am a real estate broker and have a closing scheduled next week. Last night I was feeling like I was back in my groove where money/deals just come naturally to me." "What has been interesting is that since the healing I feel a stronger sense of desire to move into a better situation financially. I've been reading books, talking to my husband about our finances and how to improve them..."
"... I set my intentions to remove blocks after blocks around money, and I saw a golden sunset and gold coins dropping down from the heavens into my hands, and a feeling of optimism about attracting all the money that I want swept over me." You Are Invited to Test drive Top Rated Email Responder Aweber for Free!